Forget merino socks, it’s time for merino shoes. 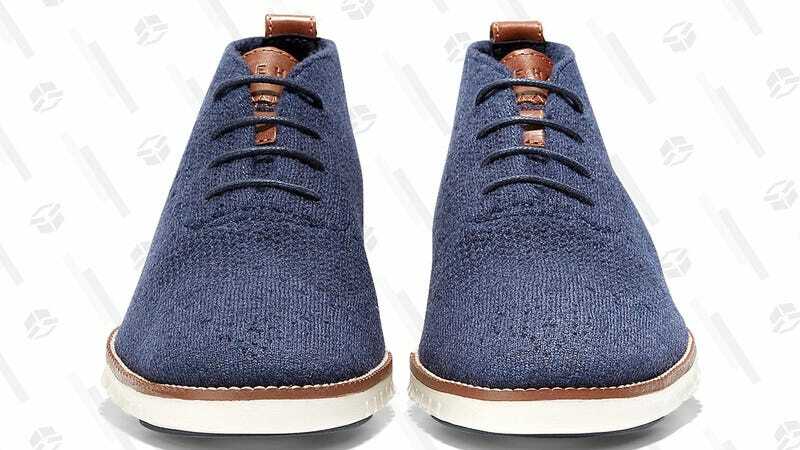 The brand new ZERØGRAND with Stitchlite Wool combines the the sneaker-like comfort and flexible-out-of-the-box sole of Cole Haan’s other ZERØGRANDs, with the lightweight woven upper of its Stitchlite series, now in a brand new wool material comprised primarily of merino and alpaca. The result? Great looking shoes that can keep you as warm as a pair of boots, at a fraction of the weight. Yes, they look like sweaters close up. Click to enlarge. My sample pair arrived just as a cold snap hit Houston, and while temperatures in the upper 50s aren’t exactly perilous, the shoes do, in fact, keep my feet toasty. Cole Haan describes it as a sweater for your feet, and that’s not far off. Transitioning from my usual pair of Greats Royales (about 19 ounces per shoe) to the Stitchlite Wools (just a hair over 9 oz.) made me feel like I was wearing a pair of slippers, and yet, the Cole Haans have enough support and look nice enough to wear out to dinner. The ZERØGRAND with Stitchlite Wool are available now as oxfords for men and women, and chukka boots for men as well, in a few different colors. Here’s hoping they make ugly Christmas sweater versions somewhere down the line.